[page 252] Certain people are especially smart. They have a talent for having good hunches, nurturing them, and having a sense of which ones to follow. These people are right too often for it to be a matter of luck. . . . Affirming contradictions and not being in too much of a hurry to get rid of them — Chaucer's dialectic — must be one of the patterns of thought that makes wise people wise. "What is the power of an unanswered question?" is one of my basic rules. This question focuses my attention on the power that derives from not accepting easy answers to questions, especially questions that present opposing contraries. Only by extended pondering of the question, which cannot happen if one accepts some sham of an answer, can an answer arise that will hover over the contraries with its glowing resolution. The world would be much different if Columbus had accepted "Fall off the edge of the world." as the easy answer to the question, "What happens if I keep sailing westward?" Instead he held his unanswered question and sailed on into history. Before you can have a metaphor, Monroe Beardsley tells us, "there must be a contradiction, a piece of non-sense." (Page 250) Elbow cites as an example the phrase leg of the table, which unless you feel that leg is appropriate only to animate organisms, "you cannot feel leg of the table as a metaphor. For most people the phrase is literal." (Page 250) Again a contrary confronts us if we recall that every word was once a metaphor when it was first used. The word quiz was painted on fences and walls all over Dublin one night by someone who won a bet that he could get a new word in general usage overnight. The nonsense word quiz brought quizzical looks to the faces of Dubliners the next morning as everyone went about quizzing each other as to what it meant. 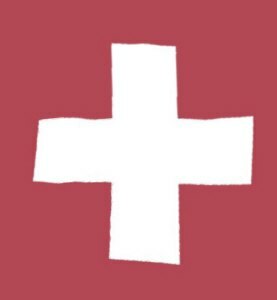 If the contraries we're asked to embrace are logical opposites such as true and false, we might end up in the logical paralysis as we try to discern a meaning in the question, "Who shaves the barber who shaves every man in the village who doesn't shave himself?" If the barber doesn't shave himself, he does shave himself. Logically it's impossible, but a computer would have no problem with it as the computer operates in time. The answer will alternate from shaves himself to doesn't shave himself as the computer calculates each answer correctly in turn. J. L. Austin directs our attention away from the logical utterance to the details of the speech situation, i.e., to what is, "a right and proper thing to say as opposed to a wrong thing, in these circumstances, to this audience, for these purposes and with these intentions." (Page 246) Austin's suggestions mirror those of Alfred Korzybski's general semantics in which we must constantly remind ourselves to attend to the what, when and where index as we talk. Audience(1) is not equal to Audience(2); Kiss(first date) is not the same as Kiss(honeymoon); Walk(beach) is the same as Walk(North Pole). But I digress from my goal of writing the review, which process is necessarily an "embracing of contraries" as the title suggests. Do I write of what I learned from reading the book or do I write my judgments of how well the book was written? Peter Elbow was my first writing teacher. I encountered him in his book, Writing Without Teachers, some twenty years ago. Now I'm reading him as part of a course in college teaching. So I've embraced a contrary by returning to the man, who said I didn't need a teacher, to learn how to become one. [page ix] All along in my writing I've been trying to do justice to the rich messiness of learning and teaching — to avoid the limitations of neat theories and pat positions. Clearly Elbow loved to hold "unanswered questions" and coined the wonderful term "rich messiness" to describe the process of learning and teaching. Does that mean that Elbow wanted to avoid the coherence of a pedagogical theory? He intimates on page x that he felt, "A hunger for coherence; yet a hunger also to be true to the natural incoherence of experience." That others in his field didn't feel this hunger bothered him. [page ix] I've always been irritated at the prejudice among so many people in higher education (particularly in institutions of higher repute) that pedagogy doesn't bear thinking about: that there's something useless and infra-dig about studying the processes of learning and teaching themselves (as opposed to the contents of the disciplines); and that whether someone learns or teaches well is mostly a matter of inborn talent, temperament, and character. Elbow likens his experience of learning and teaching to that of doing a rain dance. He says he never had any idea of what a good rain dance looked like, but if he got the steps right, rain came, "but I never knew till I was wet whether I was close. I never seemed to have any sense of what a good rain dance looked like." He lists a bunch of things in the Introduction that struck home to me. Like not being able to memorize or find certain material, and later finding that same material comes out at delightfully unexpected times and places. Like the assumption that input should precede output: Elbow finds that he "could get things to go in better" if he had been first asked to have them come out. It seems that in the implicit goal of organizing learning and teaching, some have created a neat emptiness where a "rich messiness" would be more fruitful. And like those students who "cannot remember well till they think, but are asked not to think till they can remember well." These are examples of the contraries that Elbow asks us to embrace as we work our way through this book of collected essays on learning and teaching. In this passage, Elbow delineates the basic of flaw of the banking model of teaching where students are treated as boxes in which information is deposited to be retrieved later on demand. [page 11] The implication for learning is that you don't teach anyone by feeding him information. It's processed and "filed," but whether it can ever be found again is a function of his filing and processing system which is precisely what you have left unchanged and probably very bad: brute (short-term) memory is high in the competition for man's feeblest capacity (Miller). You only teach someone if you affect the way he files his data, processes his information, or makes his inferences. Human beings are not computers, all similarities to the contrary. Computers use compilers to process statements in a language. Human beings are compiler designers and are always changing the specifications of their compilers to process statements in new languages that are too rich and messy to ever be found in a compiler designer's handbook. When our internal compilers have been restructured by some course we took, we know that we learned something that will stay with us because it affects the very way that we see and understand the world every day. [page 13] But real learning, in contrast, is the phenomenon of so abundantly "understanding" the concept in the book or lecture that it becomes part of us and determines the way we see, feel, and act — the way we process the widest range of data. We become changed when we encounter ideas and concepts that extend beyond our own. There's a contrary — it's the bootstrap metaphor — we can only learn when we learn something that we are not capable of learning, up until now. How does a program get into a computer? Another program loads it. How does that program get into the computer? It is a program and there must be a program to load it! In 1969 on early minicomputers we had to key in this program with our fingers at the front console. That initial code was called the bootstrap. It would read a piece of paper tape. The piece of tape was a primitive loader which could then load a more detailed loader. Since that time computer designers have created a simpler process for the user, who now only pushes the RESET button, but all the functions I mentioned above occur. The fat-fingered bootstrap is in ROM, the primitive loader on the first sector of the hard-disk, and the more detailed loader is loaded with the operating system. Each time we take a new course, we do not learn if we only input data; we must come to understand concepts and ideas and bootstrap changes to the way we process data from now on. We must follow the steps of the rain dance until we "get wet." [page 17] For induction produces the experience — the "feel" — of a concept before there are any words for it. It is the nonverbal experience of a concept which enables one to recognize a huge range of instances of the concept: one doesn't need verbal cues as mediation. We are so inured to the evaluation process that we have a large vocabulary for negative things to say as we judge about others' work, but not much except "good" or "fine" to say on the positive side. To counter this imbalance, Elbow evolved something he calls "movies in the readers minds", which, while he designed it for the learning and teaching of writing, seems to work as well for other fields. Noticing how little a student learns from a grade or from a short comment on a piece of writing, Elbow decided "to provide my students with an account of what was going on in my mind as I was reading — trying to give as honest and accurate a picture as possible of the effects of their words in my head." (Page 162) These personal accounts of subjective experience had a sense of truth that the student accepted because it was not verbalized judgment from some external standards, but authentic experience of one person. [page 229] There is enormous pedagogical power that comes from telling the truth — what happened to us; and avoiding lies — or at least shaky guesses about what is right or wrong in a performance. Students often fight us in our more impersonal verdicts . . . But when we simply tell what happened to us as we read their writing . . . what we say has a higher chance of being actually listened to. Peter Elbow innovated the "doubting and believing game" and says that, "I've been pestering people for more than ten years with versions of my doubting/believing essay in an effort to think my way through it." (Page xv) In this "game" we encounter the two contraries of "doubting" and "believing". Given some position one is studying, one may either believe it or doubt it at first glance. Unless one makes the conscious effort to believe in something one doubts, one will never come to see the sense of it. Unless one makes the conscious effort to doubt something that one believes in, one will never come to see the lack of sense of one's position as others see it. I first encountered the "believing/doubting" game in the Appendix of Elbow's Writing Without Teachers twenty years ago. I even made notes on the pages where it appears, so I know that I read those pages. But last year when Professor Michael Paulsen used the doubting/believing game in his course on College Curriculum, it seemed new and fresh to me. Here was an actual application. Here was the believing/doubting game integrated into pedagogy and it worked. Suspend one's belief by doubting to create an artificial belief, so that one can examine the implications of a new area with fresh eyes. Once one has applied the believing/doubting game, then one is ready for the application of one's judgment. [page 269, 270] Judgment involves looking over the results of systematic believing and systematic doubting and making up one's mind. 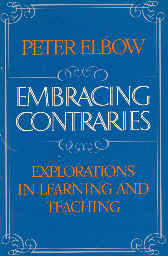 In the believing/doubting game, we must learn to enjoy "embracing contraries" in our "explorations in learning and teaching" as the book's title and subtitle tell us. Is the "rich messiness" of the believing/doubting game mere foolishness or a worthwhile pedagogy? Is it perhaps all promise and no substance? Is it like the all-purpose potion metaphor that Elbow uses on page 296: it is good for all that ails you and is "even good for polishing the family silver." What does the family silver represent? "Epistemology," Elbow says(1). The enthusiastic embracing of contraries in the believing/doubting game helps us "to figure things out." It provides us a way of changing ourselves in the process of learning and teaching so that we come to see the world differently, and in a way that lets us know we have learned something. Thomas Kuhn would call the “family silver” a paradigm, as he explains it in his book The Structure of Scientific Revolutions which he wrote in 1962. Paradigms are the family silver polished, preserved, and cherished by scientists so much that they can act as blinders to an underlying reality, much as Newton’s theory of absolute time and space had to be torn away by Einstein to reveal the previous hidden relativity of time and space.